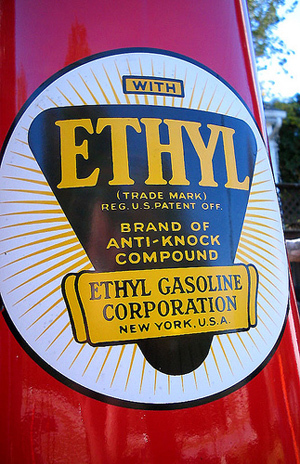 1921: Researchers find that adding a small amount of tetraethyl lead to gasoline eliminates engine knock. Generations of children and refinery workers will suffer from lead exposure. Researcher Thomas Midgley was working for General Motors under the legendary Charles Kettering to develop a fuel additive that could silence the harmful “knock” in high-compression engines. Knocking occurs when some unburned fuel-air mixture explodes in the wrong place and time in an engine’s four-stroke cycle. It can cause loss of power, engine wear and pollution. From the 1930s through the ’60s, lead remained the additive of choice. On a 1940s episode of the Burns and Allen radio show, the stars joked about a woman named Ethel Knox, whom an oil company paid to change her name. George Burns replied that his first name used to be Asbestos, and the audience roared. So what’s wrong with a little lead between friends? Consider that researchers have tied even small amounts of lead exposure to low IQ, aggression, attention disorders and delinquency. A University of Pittsburgh study found that between 18 and 38 percent of crime could be tied to lead exposure. Remember the New York crime wave of the 1970s and ’80s? Some researchers say it was all due to lead poisoning.